257 delegates descended on New York for three glorious days in early October to celebrate World Architecture Day 2013, kicking off Archtober, the city’s month-long celebration of design. After a day of exclusive tours on Sunday, 6 October, including some of the city’s impossible-to-get-into landmarks like the New York Times building and Hearst Tower, and a moving tour of the 9/11 Memorial Ground, delegates from around the globe representing nearly every continent settled into the cozy double height gallery space at AIA NY’s Center for Architecture in Soho to contemplate the world’s housing crisis. WAD’s day-long agenda of talks and panel discussions was organized around the topic Towards Eight Billion: Housing the Next Generation, one of the pressing architectural challenges of our time. The air was thick with inspiration as architects, developers and policy leaders took to the stage, showing no shortage of creative ideas for housing the next generation, from residential schemes the size of some cities to dwelling units as small as broom closets and buildings on water. You can view a photo gallery of speakers and debates here. Kicking off the day’s presentations was keynote speaker Jay Cross of Related Companies. Cross presented Hudson Yards, a project on New York’s far west side that is a veritable ‘city within a city’ for which Related has engaged a band of top architects including Diller Scofidio Renfro, KPF, and David Rockwell. Referring to the housing element of the scheme, Cross said ‘it will be well designed as the city demands it’, but he also admitted that the cost of development there would preclude affordable units, begging the question of how we as architects can crack this global issue of affordable housing. That is the question on the mind of Andy Bernheimer, an architect and educator in New York City who participated in WAD’s affordable housing panel. Bernheimer’s sentiment was that 'it takes a village to make affordable housing a reality' and that architects cannot do it alone. They need the city and the developers on board as partners to provide incentives. No incentives are needed in France though, as we learned later in the morning session. TETRARC's Boréal project, presented by Michel Bertreux, is the kind of project that would appeal to architects everywhere when considering affordable housing - a modernist and post-modernist housing block that is lean to build and operate from an energy standpoint, rich in amenities, and hugely aspirational. Antony Wood of CTBUH presented an amazing proposal of a building in China, a tower in fact, that is being constructed with lightening fast speed, with completion estimated in less than 7 months. Whilst it holds great promise for the future that technology has advanced to the point that tall towers could be brought on line in a very short timeframe, greatly cutting costs of construction and possibly being a solution to the housing crisis, some in the audience were extremely skeptical, noting that the speed of the project doesn’t allow time to consider it properly and thus if a mistake were to be made, it would be at a massive scale. Still in all Wood gave us a window into the future. If land is a premium, what can we possibly do to make housing affordable? Koen Olthuis of the Dutch practice Waterstudio addressed this question with aplomb and inventiveness. Hailing from the Netherlands, Olthuis knows a thing or two about building on water. He suggested that we could build individual houses and entire communities on water and move them around to wherever they are needed. He cited the example of the Olympic Games where facilities are built sometimes for limited use and at great expense to nations. Rather than rebuild every time the Games come around Olthuis suggested we build a one-off scheme and move it to the next hosting city. This idea is radical and inspiring but it would also mean less architecture commissions. WAD13 provided a lot of ‘food for thought’ for the architects and developers present. The day concluded with a celebration of the Center for Architecture’s 10th birthday. WAN’s Richard Coleman led a toast with Jill Lerner, President of AIANY, noting the anniversary and thanking all who participated in WAD13 and made it the exhilarating experience we hoped it would be. On the following day, workshops on various topics took place throughout the city, thus concluding the conference. At the close of WAD13 in New York, many delegates were clamoring to know where WAD would be held next year. Would it be in Rio, Shanghai, or possibly Malaysia? Two developers from Vancouver, Canada are hoping their city gets the nod. “WAD got us thinking about housing in our own community.” said Robert Fung and Richard Wittstock, partners in Salient Developments, Ltd. which completes historically sensitively housing projects with a modern edge. 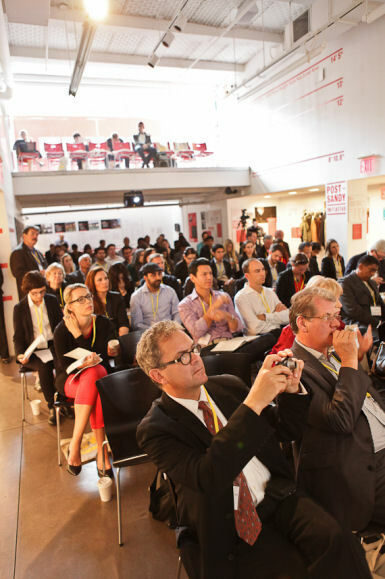 “A conference like this can spark a meaningful conversation in the city about design. If WAD came to Vancouver it could help raise the design bar in a place where it is sorely needed”. We would like to say a particular thank you to our partners the AIANY and the Center for Architecture, and to all our sponsors and supporters for making World Architecture Day 2013 such a success.